Berta Hummel was born in 1909 in Bavaria. Even as a child, she would make drawings from observing people around her. In 1927, at the age of 18, Berta Hummel enrolled in the Academy of Applied Arts in Munich. While in Munich, she lived in a boarding house run by nuns. After graduating from the Academy of Applied Arts in 1931, she entered the Convent and took the name of Sister Maria Innocentia Hummel. She was discovered by Franz Goeble after he saw post cards of drawings she had made. In 1935, the first M. I. Hummel figurines were sold to the public after the Convent of Siessen, Sister Maria and W. Goebel came to an agreement to transform her art into ceramic form. 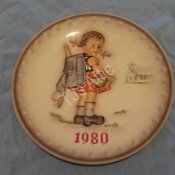 She is probably the most well known artist whose art has been molded into ceramic form by the artisans of W. Goebel Porzellanfabrik of West Germany. Sister Maria Innocentia Hummel unfortunately died at an early age of 37 years old in 1946 after being misdiagnosed with an illness that ended up being tuberculosis. 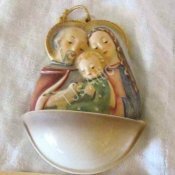 After her death, the Convent assumed the creative responsibility for all of her artwork and continued to work with Goebel to manufacture ceramic representations of her art. There are many representations of M.I. Hummels work including figurines, post cards, plaques and other gift items. We are excited to offer an assortment of quality, well priced Hummel items in our store.